You can enjoy the full 90 minute HughShows Holiday musical special right now from the comfort of your home, or phone as these nutty kids do. 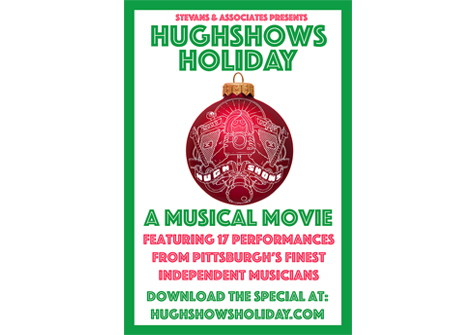 Featuring 17 performances from Pittsburgh’s most talented musicians covering your favorite seasonal classics including a few original songs written just for this special. Led by musical director Nathan Zoob, the house band (including Abigail Iksic, Shawn McGregor, Roger Romero, and Chris Trepagnier) backs guest vocalists SPISH, Mark Dignam, Sierra Sellers, Gene Stovall, Becki Gallagher, André Costello with Guy Russo, Chloe Wiecz, Markila Sherman, and Addi Twigg. Special musical guests also include Avi Diamond with Morgan Erina, Murder for Girls, Arlo Aldo, Just Fern, Molly Alphabet, Wreck Loose, Clara Kent, and the long awaited reunion of Broken Fences. For a small donation to help keep HughShows going in the new year, you can receive the full show as special gift. As an added incentive, anyone who does donate and download will be entered into a special raffle. If you are in a band and would like the opportunity to perform at the 2019 Deutschtown Music Festival in July (12th or 13th), now is your chance. One lucky winner will be randomly chosen to play on one of the four outdoor Main Stages of the festival! This year for the first time, there will be four headlining, family-friendly (clean sets, please) stages including the Foreland Stage, the Park Stage, the Skyline Stage, and the Nova Place Stage. If your band is chosen, you can choose which of these stages you would like to perform on. To be eligible, on the Checkout Page at the bottom under Additional Information, type in your band name in the Notes About Your Order field. Spread the word to your fanbase and they can donate and download and on your behalf (as long as they enter your band name in the ‘Notes’ field at checkout) to increase your chances! The download and raffle will only be available starting now until the early part of of 2019 when we will draw and announce a winner in January! Head on over to www.HughShowsHoliday.com to download.